Sweet & Sour pork,chicken & shrimp served w.special sweet sauce. 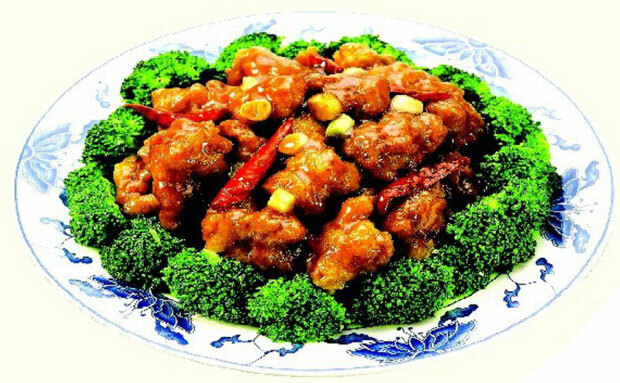 Lightly battered chicken deeply-fried & coated w.famous General tso's special sauce. Beef & shrimp sauteed w.mushroom,snow peas & baby corn in Chinese B.B.Q sauce. chicken,shrimp & beef w.scallions in Mongolian style. Jumbo shrimp sauteed in chef's special honey cream sauce,served w.honey sauce. Jumbo shrimp & chicken sauteed w.string beans in special Thai chill sauce. Jumbo shrimp stirred -fried w.fresh Jalapeno & mixed same black pepper powder to stir. Chicken,shrimp & beef mixed w.green pepper,onion,broccoli,celery & carrot. Sauteed scallion,shrimp,crabmeat & mixed vegetable w.house flavorful sauce. Fresh scallop,shrimp & chicken,beef sauteed w.mushroom,snow peas & broccoli in brown sauce. Shrimp w.vegetable in a flavorful white sauce on one side & general tso's chicken on other side. Fried Shrimp,Teriyaki Beef,B.B.Q Rib.Chicken Wings.Crab Puff,Egg Roll. Beef,Shrimp or Chicken w.Garlic Sc.